5th April, 2017, Sofia, Bulgaria - PlayBox technology EU (PBTEU) has upgraded its advanced captioning software SubtitleNext with additional features and applications that provide subtitle editors and content owners with cost-effective benefits by delivering uncompromising speed and precision. SubtitleNext has been further refined to cater for the relentless upsurge of online content such as live news streaming, YouTube videos and other OTT services to benefit and support professionals. PBT EU’s exciting new developments in SubtitleNext have arisen in response to the ongoing rapid growth of content across multiple platforms and the industry crying out for prompt advances in technology that can keep up. These latest upgrade additions ensures that the constant demand for extremely swift titling services is met, at affordable rates. SubtitleNext is revolutionary and dramatically improves pace and productivity, simplifying processes throughout the entire work cycle. The application is suitable for newcomers and industry professionals in highly demanding positions. With a 25-year legacy, it supports historic and existing subtitling and media protocols, standards, and formats, and is flexible enough to easily be extended with new options. 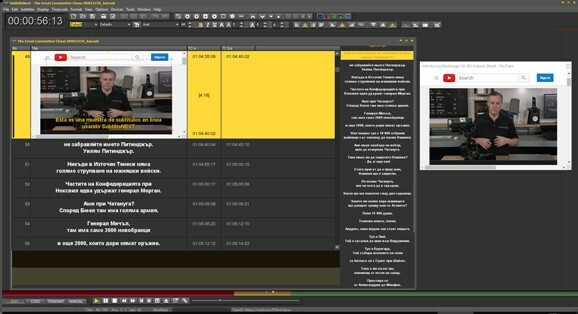 The product line also includes several software licensing levels and options, ranging from entry level SubtitleNext Novice, right up to SubtitleNext Expert. Key enhancements in SubtitleNext offer users full support for virtually all known forms of content and live video. This includes direct access of online video content which is both unprotected and DRM-controlled, for existing and private schemes, apart from downloaded or preprocessed material. Live analogue, SDI and various forms of streamed video have also been upgraded to enable lightning-fast performance with accuracy. Other new features include multiple Region definitions (display regions), which can be used for various purposes with corresponding subtitle assignments, such as subtitle positioning and groupings, which provides for simultaneous multiregional displays. SubtitleNext’s latest version also embraces SMPTE - TT standards and burns to new video formats such as h264 and h265, supports 3D subtitles and giant formats and resolutions from 4K, 8K, 16K and beyond. It can air various graphics, as well as text based outputs and standards, while also supporting uncompressed graphics, and much more. Kamen Ferdinandov, CTO of PBT EU states, “The latest improvements and add-ons allows multiple workflow combinations for direct integration with different collaboration and media asset management systems, private and public media stores, various channel origination and retransmission solutions such as traditional broadcast, IP, WEB TV and so forth. This way, we can offer users a hybrid model which combines the benefits of both desktop and web solutions." The growing 'evolution in subtitling', - from the move to HD; the ongoing need for improved subtitle presentation; the introduction of file-based production workflows, to the inescapable convergence with web and online data, - effectively propelled PBT EU to develop SubtitleNext in the first place to provide an adaptable solution to meet varying customer requirements in a fluctuating and often disruptive environment. Subtitles are effectively highly profitable timed text, metadata, transcripts and metatools, and PBT EU regards the enormous value and flexibility that high-quality toolsets deliver. SubtitleNext can also be used to play a vital role, for example, in improving speech recognition and literacy, aiding communication, providing language learning support and live remote captioning, help the deaf and hard of hearing – the advantages are limitless and benefit many other industries too. Accurate timed text used online can also help power searches, target advertising, increase search traffic, page views, search rank and engagement and therefore increase awareness and attract new business.